Pain behind the knee can lead to serious complications if you don’t receive knee pain treatment. At the very least, back-of-knee pain, posterior knee pain and inner knee pain can sideline you indefinitely until you find some knee pain relief. Knee pain has a large number of causes and should be investigated by a top knee specialist. Come see our pain management clinic to get a knee pain evaluation and treatment. 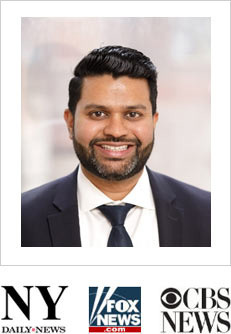 Meet our pain management doctor Dr. Melepura to get the pain relief you need in the safe, reassuring hands of the best pain management specialist in NYC. Tear to your anterior cruciate ligament or ACL. The ACL is a ligament that attaches to your thigh bone and shin bone. ACL injuries are common among basketball and soccer players, as well as other athletes who make sudden stops and turns while playing. Bursitis. This occurs when the fluid-filled sacs wear down and one bone begins to rub against another, sending you to your NYC doctor for knee pain relief. Very often, this condition leads to inner knee pain due to wear and tear over time. Meniscus tear. A tear to your meniscus can happen when you suddenly twist or turn and rupture the natural shock absorbers in your knees The cartilage between your thigh and shin bones also causes inner knee pain when you carry excess weight. Broken patella. Breaking your knee cap can result from a car accident or bad fall. When you have weak bones or osteoporosis, you’re more prone to fractures. 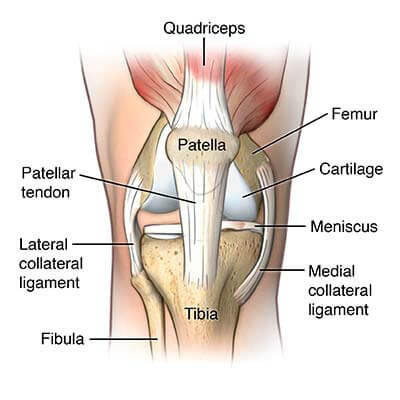 Tendonitis and patellar tendonitis occur when tendons cause pain behind the knee and in front of your leg after becoming inflamed and irritated. Referred pain also is common and can lead to posterior knee pain or inner knee pain when you have tendon damage in your hips, feet or ankles. Basketball, during which you have to make a lot of pivots that place enormous stress on your ligaments and patella, leading to back-of-knee pain and stress fractures. Running, one of those sports that causes damage all up and down your legs. The constant pounding places your knees at risk for knee pain treatment soon after you begin jogging or after many years. Skiing, which has a high incidence of fall risks. Additionally, locking your ankles into rigid boots places more stress on your knees when you do fall or turn awkwardly. It’s important that your Midtown Manhattan physician gets a complete picture of your knee pain history before coming up with a knee pain treatment plan. He needs to know when your pain first started, how bad it gets, when it’s worse and what gives you knee pain relief, if anything. Treatment for knee pain in New York City always begins with the most conservative techniques, such as physical therapy, strengthening exercises, over-the-counter anti-inflammatory medications and rest. Often, treating underlying conditions such as obesity or rheumatoid arthritis can lead to significant knee pain relief. Do you have any questions about the knee pain treatment options we offer in NYC? Would you like to schedule an appointment with the best rated knee pain doctor Febin Melepura MD of pain management clinic in New York ? Please contact our office for consultation with the knee pain relief specialist in Midtown Manhattan.